No New York City closet was ever big enough to contain the fashionable imagination of Nick Wooster. That all changed when he found MakeSpace. It makes sense that a legendary New York style icon would discover the way to have an infinite closet. With summer winding down and Fashion Week right around the corner, apartment-dwelling New Yorkers are faced with the quarterly debacle that is seasonal wardrobe changeover. The menswear icon lovingly referred to by his fans as “The Woost God” is one such NYC resident who used to loathe semi-annual visits to his storage unit. In March 2014, Nick was telling a friend at Bergdorf Goodman about how much he was dreading the daunting task of schlepping his bulky winter clothes to his storage unit and excavating his spring ensemble from somewhere in the mountain of boxes. His friend suggested that he check out MakeSpace to do all the heavy lifting for him. He signed up that night and was out of his storage unit the next day. We caught up with Nick at his beautiful West Village apartment as he unpacked MakeSpace bins full of his fall favorites for a Fashion Week photo shoot the following day. 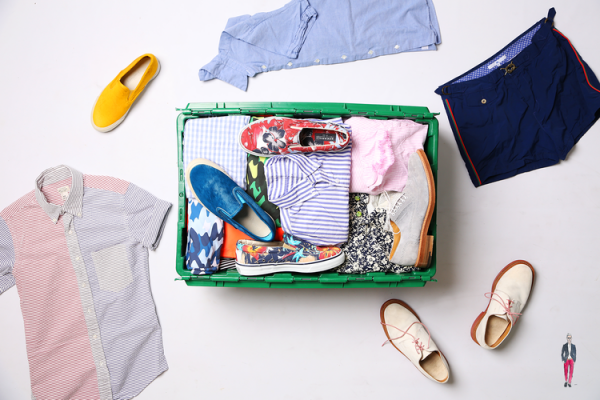 With summer winding down he refilled his bins with floral-print Sperry’s, gingham button downs, seersucker shorts, and an unbelievable assortment of swim trunks to be sent back to MakeSpace. Even cooler than seeing his legendary wardrobe in MakeSpace was hearing about all the project’s he’s been working on. From his own Capsule Collection with Italian luxury brand Lardini to “The Wooster,” a shoe he collaborated on with the men’s footwear startup GREATS. We’re excited to call this legend a MakeSpace member.